Hot melt adhesives and applicators for use in foam & mattress industries. In mattress and furniture assembly, adhesives are used for positioning the various soft layers and foams prior to covering. They are also used for making the spring pockets used in mattress construction. During mattress construction, a spray adhesive is normally used for arranging the foam and padding elements that make up the soft top. It gives fast coverage and an even tack over the whole area. The adhesive does not have to be particularly strong but it must be flexible and odour free. Historically both water and solvent-based spray adhesives can be used, however both have inherent problems when used for mattress and soft furniture construction. Water based systems tend to be slower setting as they rely on the evaporation of the water to set. This water evaporates into the soft material of the mattress, and is then trapped there by the polythene bag packaging typically used to protect the mattress during storage and transport. This trapped moisture can lead to mould and bad odours tainting the new mattress. Water-based adhesives must also be kept from freezing during transport and storage and will set in the application equipment if not flushed through the system prior to down time. Solvent-based adhesive systems set faster as the solvent evaporates more quickly than water, but the adhesive tends to go air born when it’s sprayed. This contaminates the working area and the operators with both adhesive residues and solvent vapours, neither of which are good. Solvent adhesives also present a fire risk as they are volatile and highly flammable. They will also set in the application equipment and require solvent for cleaning. Equally, they will taint a mattress with strong solvent smells which get trapped by the polythene packaging. Over recent years, hot melt adhesives have become the preferred adhesive to use for this kind of application. They contain no solvents or water, and simply set by losing the heat they are applied with and then solidifying. 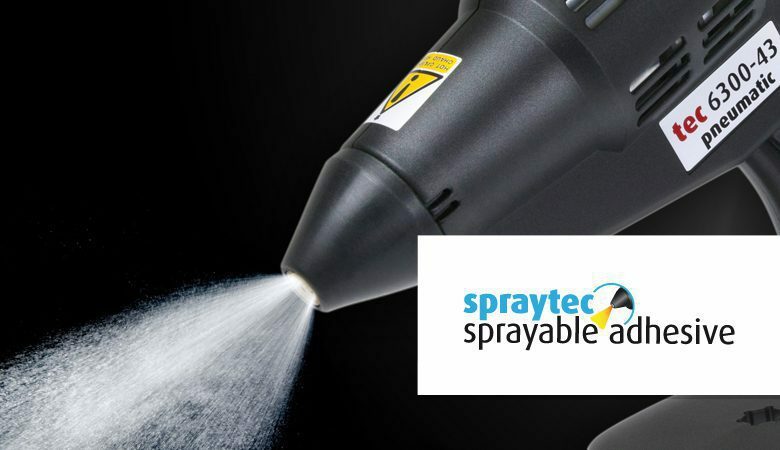 This means that hot melt spray adhesives give far more instant grab than either water or solvent based adhesives are able to. It also means less hot melt is required to provide a given level of tack, which increases mileage and reduces cost. The instant grab also means that shaping springy foams around framework is possible. Specific grades of hot melt have been created for pocket spring production, and their unique chemistry matches that of the spring pockets – creating instant, strong, flexible, odour free bonds. Equally, spray hot melt formulations like tecbond 420 and 425 are used extensively for mattress soft top construction and other upholstery foam applications. They can be applied using the tec 6300 and tec 7300 industrial hot melt spray tools. These relatively low cost spray guns need a simple power supply and a low volume air supply. They are simple, robust hand tools, and are easy to service and maintain on the production floor. Because of the relatively low cost involved, many factories keep a couple of spare guns so that they can be changed out in less than 5 minutes if there is a problem on line. Hot melt adhesives set when cold, so simply turning a gun on will melt the adhesive in the tool and the gun will start to work, with no cleaning or purging required. The adhesive is easily loaded and is packaged in a low cost recyclable carton. It has an indefinite shelf life and is 100% solid. Even better, everything you pay for is used as nothing evaporates. It is no wonder that hot melts are rapidly becoming the favourite adhesive system for mattress producers.